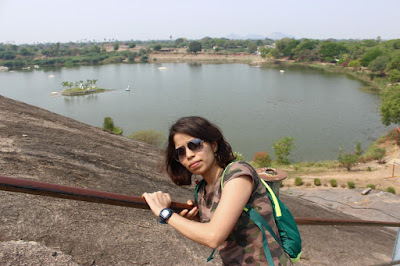 A trip to Warangal was on my mind for few years before it became reality. A college friend who was working in Hyderabad had told me about his scooter ride from Hyderabad to Warangal and back. It was a terrifying experience for him and he would never try anything like that again. Warangal is about 150 kms from Hyderabad. 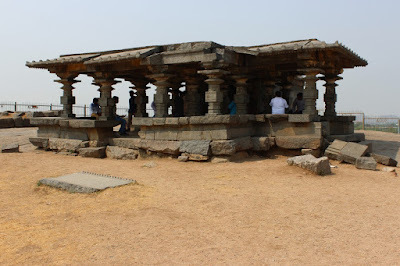 Our plan was to leave early morning, reach Warangal early so that all important spots could be covered. Our journey started around 5-00 AM. Having visited Bhuvanagiri, we were familiar about the route to Uppal cross.. that's where the road to Warangal starts. Once past the Outer Ring Road, the highway is six lane. We made good speed and passed by Bhuvanagiri around 6-30 AM. About 10 kms from Warangal the 6-lane road abruptly ended giving way to a 2-lane road. We still had 80 kms to go, our time changed significantly. We would be reaching an hour later than planned.. never mind, we were on a vacation, no need to think too much of time. We stopped for bandi breakfast at a Raghunathapalle. By 8-30 we'd reached Hanumakonda and by 9-00 we were at Warangal fort. 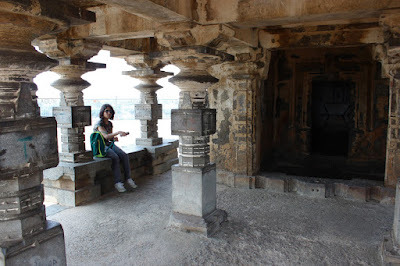 At Warangal fort, our first stop was at the open-air museum. We spent close to two hours checking out the Kakatiyan art. 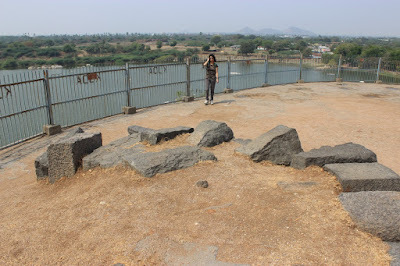 At the museum was a map of Warangal fort showing the important spots within it. 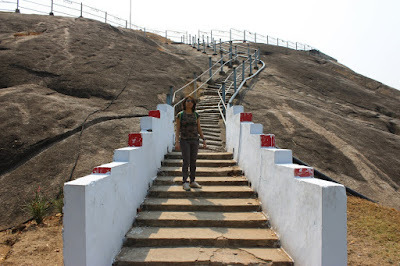 The next closest spot was Ekasila Gutta meaning Monolithic hill. The monolith is situated next to a small lake named Gundu Cheruvu. Here's the monolithic hillock, to my right is the lake. 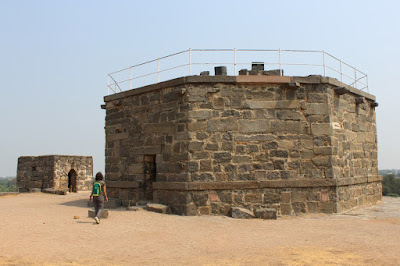 Atop the hillock is an ancient temple and a watch tower. There she is resting half-way up. The lake has a small island at the center. Tourists can rent boats here late afternoon. The view of the hillock from the boat would be interesting. The summit came into sight; its a small plateau. 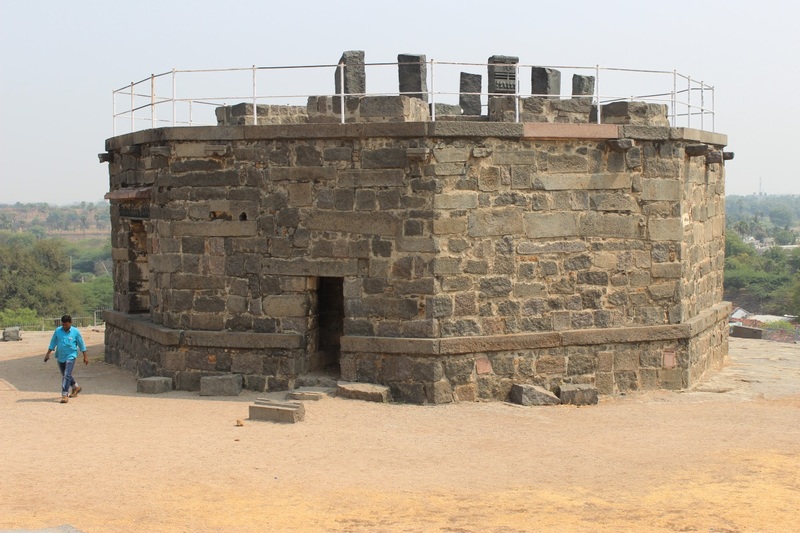 On one side is an east-facing temple; on the left is a watch tower and a small room for a sentry. 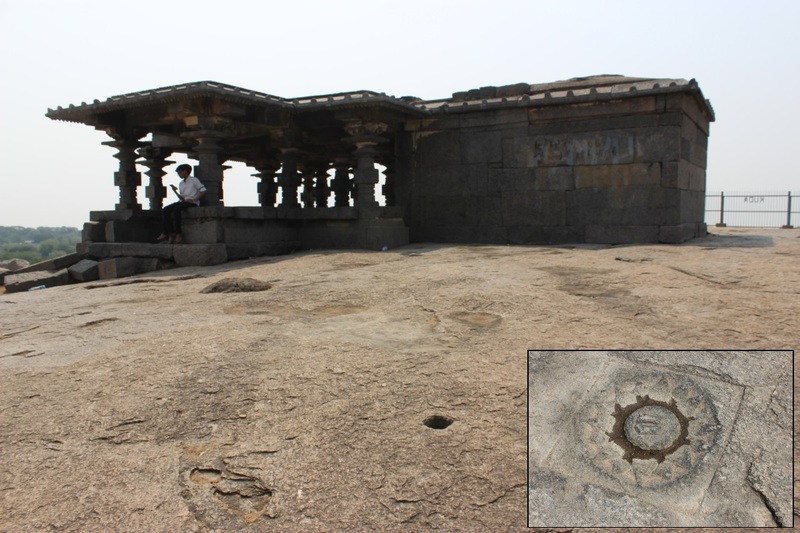 Close to the temple is a sculpture of a lotus with a pair of feet at its center (see inset). This seems like a Jain sculpture. 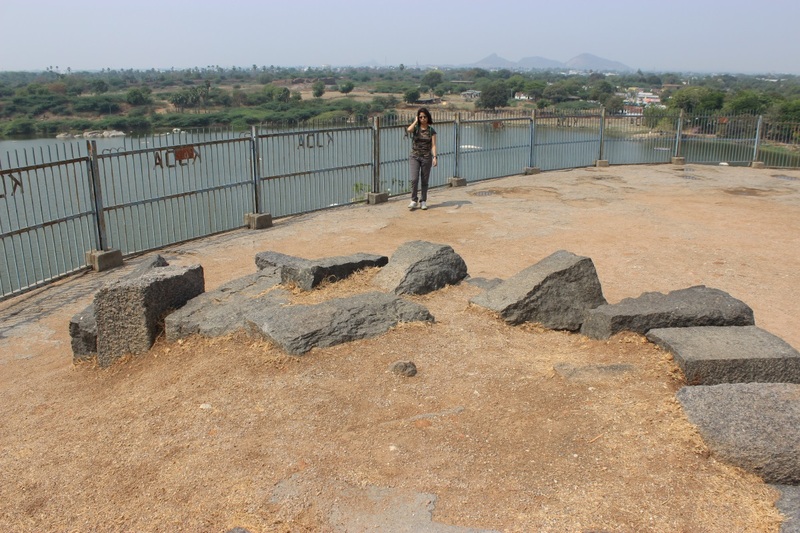 There's another hillock in the city, next to Bhadrakali lake, on which a Jain Basadi dedicated to Padmavati. 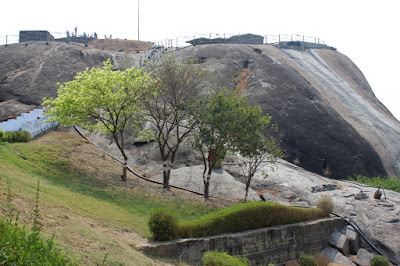 So it seems that even this hill was used by Jain monks at some point of time. 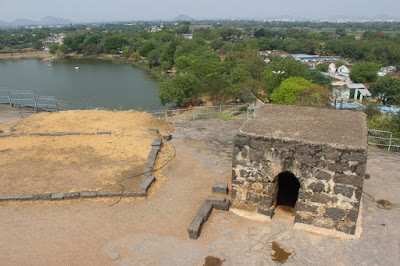 Another view of the lake; this is from a small mound next to the temple. The mound is probably ruins of a platform. The watch tower and sentry room. The tower is octagonal in plan, about 20 feet high. This tower and sentry room seem to be constructed much later than the temple. Atop the tower is a platform for a cannon however its in ruins. I guess the archaeology department has placed some ancient sculptures on the tower making it a mini museum. There's only one narrow stairway to the tower top. The curved stair-way opening at the tower top. 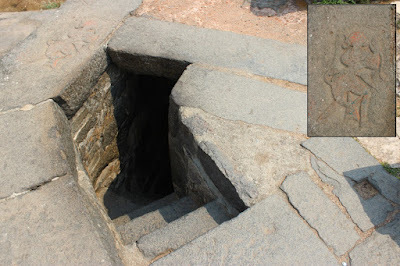 On the rim of the tower, one of the slabs next to the stairway, has an image of Lord Hanuman, The image is a typical form of Hanuman (see inset). View of the sentry room and a foundation of another structure. The temple as seen from the tower. 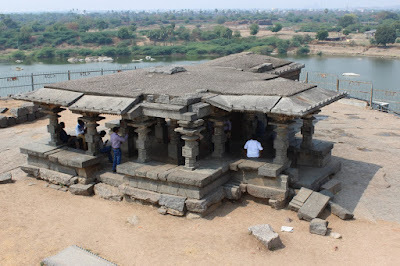 Its a Ekatachala meaning a temple with one sanctum. As you see, the temple has a wide front side with three entrances. The roof is flat devoid of tower over the Garbhagudi.The roof is surrounded by sloped porch. The temple has ample space inside; it has a spacious Sabha Mantapa and Sukhanasi. At the center is a four-pillared Mantapa which would be the Natyaranga ~ the dance floor. Ground level view of the temple. Its a simple looking structure yet a beautiful one. The temple is preserved fairly well. One of the reasons for its good condition is its location; being situated on a rocky hillock, its foundation is firm. Also being situated at a height, it has been relatively safe from vandalism. 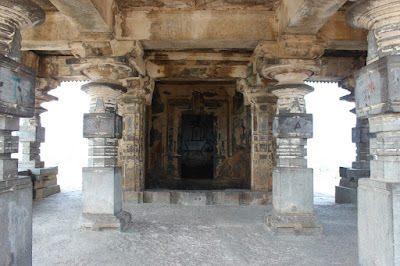 The interior; Garbhagudi is devoid of deity. 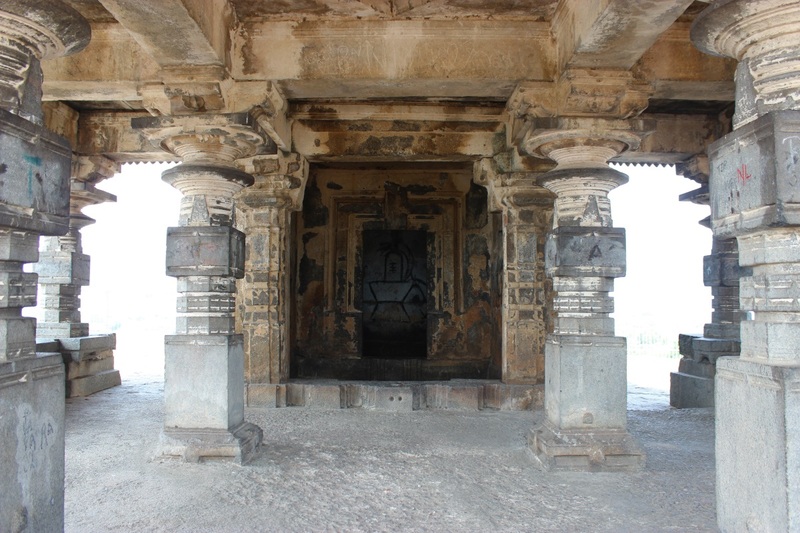 The temple design and architecture is similar to Chalukyan temples. The pillars are very much Chalukyan. It is possible that Kakatiyan architecture might have evolved from Chalukyan temple architecture. That's Pushpa resting on the Sukhanasi. With a gentle breeze blowing, the interior was cool. A nice break from the glare and heat. This hillock and temple are part of the garden maintained by government - thanks to the restricted access. else this would be a place for gamblers and other kind of activities. Had we come later in the afternoon, we could have enjoyed a cool boat ride and also got a good shot of the hill from the boat. Well, some other day. Since your web log is about Karnataka why did you put the story of another state? Thanks for asking. This blog has no boundaries. The actual title is "Journeys across Karnataka ..and beyond"